Talking Dictionary is the dictionary that includes speech. Not only is this app an extensive dictionary, but it can also speak the words you look-up. But Talking Dictionary has more to offer including a thesaurus, and translation service supporting many languages such as Hindi, Arabic, French, German, Spanish, and Italian. 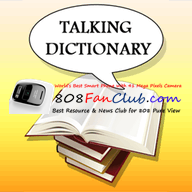 Get your free Talking Dictionary now and enjoy the all-in-one dictionary, thesaurus, and translation experience.